Field engineers at Olympus KeyMed Ltd have turned to Rigel Medical’s Uni-Therm analyser for improved medical device compliance and safety testing. Olympus, which has been at the forefront of designing endoscopy and microscopy products, medical and industrial equipment for over 90 years, uses the advanced Uni-Therm for in-service performance testing of its electrosurgical devices. These items of equipment use electricity to produce enough heat to enable surgeons to cut body tissue or seal bleeding vessels during operations. Twenty Uni-Therm units have been specified to allow automation of the performance testing of Olympus’s electrosurgical equipment, resulting in greater efficiencies. Already, the new testers have enabled engineers working at sites across the UK to accurately measure the performance of each device and complete high frequency leakage, high current, power distribution and patient return plate alarm testing. 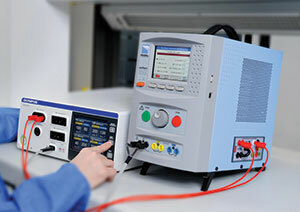 Compliant with IEC 60601, the high performance Uni-Therm is capable of verifying and calibrating the electrosurgical equipment while guiding the engineer through all test procedures automatically and most of all safe. Olympus is a leading manufacturer of advanced optical and digital equipment for the healthcare and consumer electronics sectors, leading the way in designing endoscopy and microscopy products among others. Martin Wallace, head of field service at the Southend-on-Sea based company, said: “Rigel supplies us with a range of high performance, high quality instruments, which provide the engineers with convenient, easy-to-use and accurate testing solutions. “The engineers appreciate the fact that they are compact enough to carry around with them and offer full automation of test procedures, leading to more efficient testing schedules and improved standards of customer service and care. “The Uni-Therm incorporates an excellent range of features for a tester of its size, while the added value benefits, like improved connectivity and ease-of-use, are particularly impressive. He also said that Rigel after sales support is very good, which is another reason why he chooses to use its products - in particular, product training’s very good while the company’s responsive to his needs.